Think a multiple choice presidential trivia might be easy? Think again! Even with a fun little refresher course on the American Presidents a la the above Animaniacs' music video, we're sure you'll find the questions below challenging. 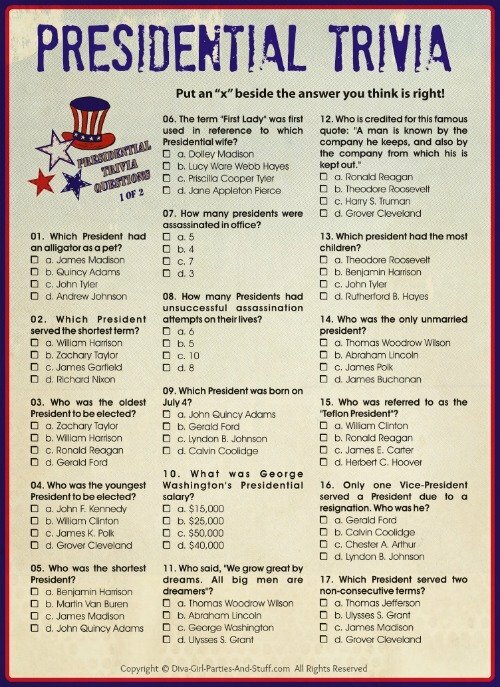 Use this presidential trivia in the classroom or add it to an inauguration party or Fourth of July event. Omit the multiple choice answers and it's perfect for a game of Jeopardy or a pub night trivia competition too. Did you know that three U.S. presidents died on the 4th of July? John Adams and Thomas Jefferson both died on the 50th anniversary of the signing of the Declaration of Independence, July 4, 1826. Five years later to the day James Monroe died. 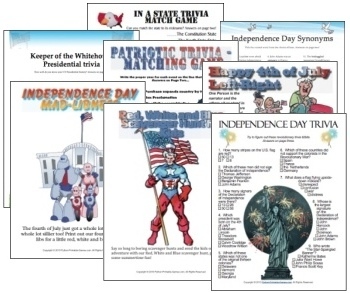 Do you know which president was BORN on the 4th of July? Do you know which presidents had unusual pets? How many presidents faced impeachment? Enjoy using this presidential trivia to discover how well you and your guests know the historical facts of the men who've held the highest office in the United States of America. And, if you're a pet lover try our NEW All the Presidents' Dogs game. 01. Which President had an alligator as a pet? 02. Which President served the shortest term? 03. Who was the oldest President to be elected? 04. Who was the youngest President to be elected? 05. Who was the shortest President? 06. The term "First Lady" was first used in reference to which Presidential wife? 07. How many presidents were assassinated in office? 08. How many Presidents had unsuccessful assassination attempts on their lives? 09. Which President was born on July 4? 10. What was George Washington's Presidential salary? 11. Who said, "We grow great by dreams. All big men are dreamers"? 12. Who is credited for this famous quote: "A man is known by the company he keeps, and also by the company from which his is kept out." 13. Which president had the most children? 14. Who was the only unmarried president? 15. Who was referred to as the "Teflon President"? 16. Only one Vice-President served a President due to a resignation. Who was he? 17. Which President served two non-consecutive terms? 18. George Bush said that this President was "known to receive guests in his bathrobe and slippers." 19. Which First Lady had the very first bathtub with running water installed in the White House? 20. Who was the first President to wear trousers instead of knee breeches? 21. Who was the first President to be born a U.S. citizen? 22. Besides President Clinton, who was the only other President to be impeached? 23. Which President was awarded the Nobel Peace Prize? 24. Which President is credited with the creation of the phrase "OK" or "Okay"? 25. Which President was famous for his cooking? 26. Which President played saxophone in a high school jazz trio? 27. Who was the 35th American President? 28. What is the most common presidential first name? 29. Which president had pet elephants? 30. Whose presidential campaign slogan was "A chicken in every pot, a car in every garage"?